1st Seal company to put a seal portal on-line customers could now order 24/7. Mica gaskets are laminates made from Mica impregnated with resin, stacked and pressed at high temperature and pressure to achieve polymerisation. Mica Gaskets are available in thicknesses from 0,1 to 75mm (4 mils to 3"). The mica gaskets can be supplied punched or machined by American Seal & Packing according to your specifications. - Supports for heating resistors (i.e. convectors). We cut gaskets from Aflas sheet gasket material. Aflas is an elastomeric based flouorubber, a copolymer of tetrafluroethlene and propylene. EPDM gaskets provide excellent chemical resistance*, and good electrical properties. This material meets ASTM D-2000-2BA specifications. We cut Nitrile Gaskets (also called Buna-N) from any of the following Nitrile gasket materials. Nitrile-N Gaskets Good resistance to many oils and chemicals. 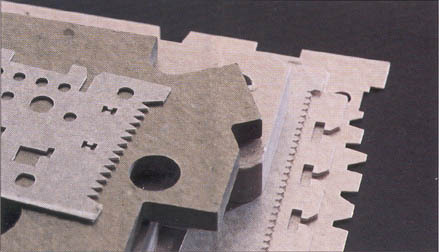 Mica Cut Gaskets cut to your dimensions. Call American Seal & Packing at (714) 593-9780 for your Mica gaskets.